n= Numbers of mols of gas. R= Constant named “universal gas contant”. This law is mixture of the old boyle’s Law and Charles’ Law. It adopts that the molecules occupy no space and have no attractive forces which is apply at low pressures and the compounds temperature are a long way from their condensing temperature. n= Numbers of moles of gas. R= Constant named “universal gas constant”. “The compressibility factor (Z), also known as the compression factor or the gas deviation factor, is the ratio of the molar volume of a gas to the molar volume of an ideal gas at the same temperature and pressure. It is a useful thermodynamic property for modifying the ideal gas law to account for the real gas behavior. In general, deviation from ideal behavior becomes more significant the closer a gas is to a phase change, the lower the temperature or the larger the pressure. Compressibility factor values are usually obtained by calculation from equations of state (EOS), such as the virial equation which take compound-specific empirical constants as input. For a gas that is a mixture of two or more pure gases (air or natural gas, for example), the gas composition must be known before compressibility can be calculated. Z =0, the value of Z tends toward 1 as the gas pressure approaches 0, where all gases tend toward ideal behaviour which lead to the actual volume equal to the ideal volume. Z < 1 , the value of Z is less than 1, at intermediate pressures because the intermolecular forces of attraction cause the actual volumes to be less than the ideal volume. Z > 1, the value of Z is greater than 1 and ultimately tends toward infinity at high pressures due to the intermolecular repulsive forces cause the actual volumes to be greater than the ideal volume. Where yi is the mole fraction of each component in the mixture and Tci and Pci are the critical values for each component. Now extract Z factor from the below figure (from GPSA Data Book). Katz compressibility factor chart give the data on “Z” as a general correlation. Katz Correlation for the compressibility factor is extended by Wichert and Aziz for the gas containing H2S and CO2 to get on account this difference. Wichert and Aziz introduce a new term a “critical temperature adjustment factor,” ᵋ, which is proportional to the concentrations of CO2 and H2S in the sour gas. ᵋ : Correction factor in degrees Rankine. A : mol fraction H2S plus CO2 in the gas. B : mol fraction H2S in the Gas. After calculation of the corrected value of the pressure critical value and temperature critical value, we need to calculation the corresponding reduced values. Finally you can read the Z factor from the regular standing and Katz chart (above chart). How to calculate the compressibility factor of natural gas using Katz chart, E. Wichert and K. Aziz? Calculate the Pseudo Tc and pseudo Pc for a mixture in the regular manner. Find the value for ᵋ depending on the composition. Calculate pseudo reduced temperature and pressure using the above data. 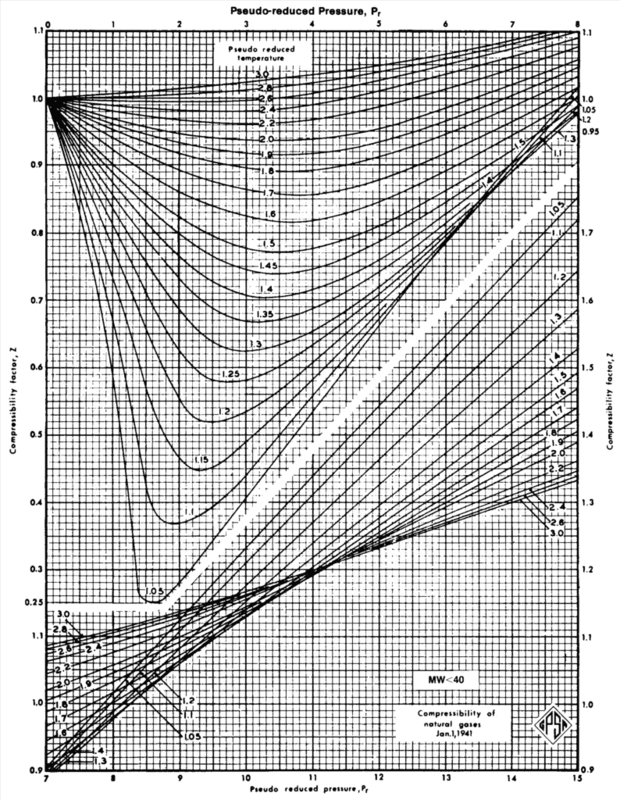 Read “Z” from regular standing and Katz chart, Fig shown above (16-3 GPSA Data Book). a and b are talk about to as “the Van der Waals constants”, they are not really constants since they differ from one gas to another; they are, however, independent of P, V and T. In other terms, they are constant for the gas selected. Where A, B, a, b and c are constants Beattie Bridgeman Equation for chosen gas. This constants are relates to pure compounds and mixtures of gases similar chemical species. This correlation should not be used for liquid phase behaviour. Where B0, A0, C0, D0, E0, b, a, α, c, d, ϒ are constants for a specific compound. Try our How to Read P&ID Piping and Instrumentation Diagram for non-process engineer? Calculate the compressibility factor of methane using our online tool or just use our calculator for compressibility factor calculator reduced pressure and temperature tr pr. Reference: Natural Gas Processing Principles and Technology. PERRY’S Chemical Engineers Handbook. Gas Conditioning and Processing Volume:1.